A couple weeks ago Tristan fell and knocked a tooth loose. 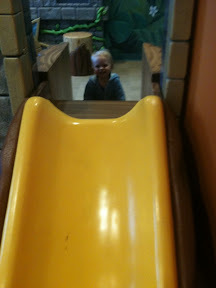 I took him to his pediatrician and she wanted him to see a dentist. There weren't any pediatric dentists in Huntington, but I got lots of recommendations for Teays Valley Pediatric Dentistry. I called them and just so happens they were opening a Huntington office this week. Yesterday was Tristan's appointment and I COULD NOT BELIEVE the place! This is in the waiting room. The rest of the elephant is back in the hallway. This is the reception desk. 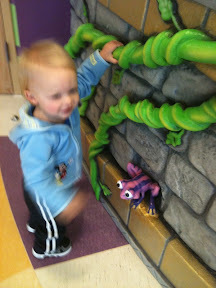 Tristan LOVED the frog. 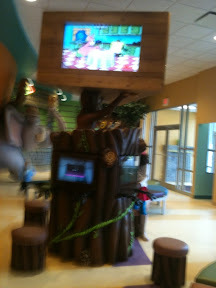 It looked like a tree, but had 3 bigscreens with cartoons At the top and X-Boxes around the middle with stools that looked like stumps. 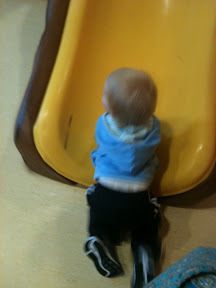 It's blurry because Tristan was running away (you can see him as a blue blur). There was a room with a kid sized doorway. 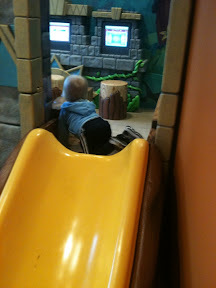 On the wall were touchscreen video games and on the other side was a little slide. 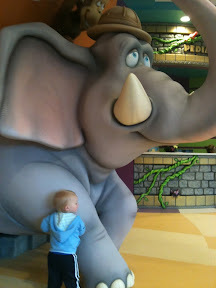 There were other animals throughout the building including a second waiting area for siblings who have appointments together with another full sized elephant dressed in safari gear with several PSP's in his satchel! The place was AMAZING! Tristan loved the hygienist! She let him ride the chair up and down and play with the tools. The doctor came in to check out his mouth and I laid Tristan back on my lap so I he could look. Tristan cried though his exam, but didn't try to bite or even close his mouth! I was proud. The dentist said his tooth was very loose, but would hopefully tighten up. 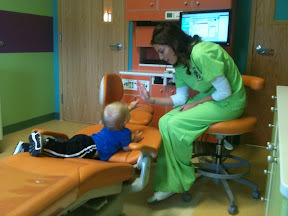 He also said Tristan's teeth looked great, no spots or cavities, and he had all the ones he was supposed to at his age. He got a ball and tattoo for being good and as I checked out he talked so much the the receptionist that she had another girl come talk to because he talked so well. WOW I am s impressed. They know what they are doing for sure.